Share your thoughts about the draft Central West Planning Principles! All are welcome to attend, and please invite your friends and neighbors! The Central West Steering Committee has developed draft planning principles that define the important elements to be considered in Central West Focus Area small area plan. We invite the community to provide their thoughts and feedback about the principles during this drop-by session! Town seeking your input about the "Central West Focus Area." This this quick survey now. 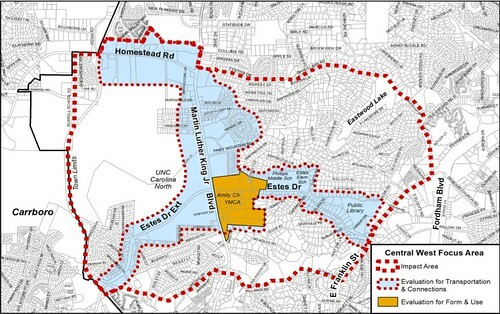 Read more about Town seeking your input about the "Central West Focus Area." This this quick survey now. After a lengthy discussion at the January 24 county commissioners' meeting, a couple of decisions were made regarding the continued meeting of the Historic Rogers Road Task Force. First, by unanimous vote, the commissioners approved moving forward with completing plans to fund and build a community center for the Rogers Road community. There was less agreement about the charge of the task force. Commissioner Mark Dorosin wanted to have the task force consider the potential for gentrification in the community once the sewer was extended to all eligible homes. Commissioner Earl Mckee disagreed, stating that homeowners should be able to decide for themselves the highest and best use of their property. There were a variety of motions, friendly and unfriendly amendments made, votes taken, and wordsmithing done until, ultimately, a motion was made to charge the task force to continue their work on extending sewer service, completing the community center, addressing gentrification, and use of the Greene Tract as a funding option. This motion was passed five to two (Commissioners Penny Rich and Bernadette Pelissier voted against).